Most Australians learned little about Aboriginal culture, yet are hungry for more. Educating non-Aboriginal Australians could help combat racism and discrimination, but teaching still hasn't caught up. The Australian education system not only struggles to bring education to Aboriginal children, but also taking the fear out of non-Aboriginal students to learn about Aboriginal culture. Many think if they don't know enough they don't have the right to contribute to the conversation, an attitude which hampers the dialogue true reconciliation requires . 94% of parents of school-aged children want them to have an understanding of Aboriginal people and their history. 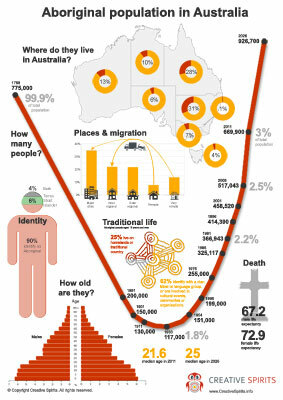 At the same time more than 80% of Australians feel that they know little or nothing about Aboriginal culture . They were brought up on a diet of what the anthropologist W E H Stanner labelled “the great Australian silence” , the reluctance to talk about the ongoing cultural differences between Aboriginal people and the dominant culture. After completing high school, students fail to know enough about Aboriginal culture. "I lecture in a progressive university where Australian Indigenous Studies is a compulsory core unit for all trainee teachers," says Aboriginal academic Stephen Hagan . "But despondently, only 5% of my annual intake would qualify as having a basic operational knowledge of Australian Indigenous peoples after 12 formal years of schooling." Jade Jones-Cubillo, a young Larrakia and Jawoyn woman, found her education didn't prepare her at all. Teachers struggle with teaching Aboriginal studies well because they haven't been provided with adequate course work during their own studies on the topic at university . Author John Danalis, in his book Riding The Black Cockatoo, writes: "Initially it was hard to come to grips with Aboriginal culture and society. Its mind-bending timeline; its astonishingly distinct yet interwoven diversities. In many ways it reminded me of the complexity of Europe. "Imagine doing a crash course on European peoples, their cultures, languages, cuisine, art, architecture, folk tales, myths and belief systems, and then trying to summarise in a few neat paragraphs what it means to be European; it would be an impossible task. In rural Australia, young Australians grow up assuming that Aboriginal people are "like animals" . Once they get to know them, however, their stereotypical opinions can change, a huge cross-educational benefit. Aboriginal Professor Mick Dodson recalls a classroom experiment he was told on a school visit . "A class of grade 5 students and their teacher go out for a school trip. When they return, they find that the grade 4 teacher and her students have taken over their classroom. They are told the desks no longer belong to them, or the bookshelves or the blackboard. The grade 5 students, confident of what is theirs, ask for it back. The grade 4 students refuse; it all belongs to them now and their teacher supports them. Not only do they refuse to give it back, the grade 5s are asked to stand aside, to stand on the fringes of the classroom. The grade 5 students start to get upset and angry – ‘give us our classroom back’, they insist. The grade 4 students don’t budge. The anger of the grade 5s turns to frustration and a sense of hopelessness. The grade 4s seem to be settling in to stay. Like the famous ‘blue eyes’ experiment that taught students in the US how rapid and devastating institutionalised racial prejudice can be, the colonisation of the grade 5s classroom at Majura School in the ACT produced an almost immediate and keenly felt response of injustice and marginalisation in the dispossessed students. The classroom colonisation has that critical experiential dimension of learning that we so often fail to include when teaching our children and it’s just as important as the content of history books." Sharing Culture offers schools access to Aboriginal knowledge for use in the Australian Curricular. It gives voice to Aboriginal people and communities to provide first-hand resources for learning. This helps children learn directly from Aboriginal people and demonstrates how Aboriginal communities own their knowledge and intellectual property. When Stolen Generations member Helen Moran told high school and college students her story "many students were outraged to learn that no-one had told them the full, truthful story about Australia's history until this late in their schooling, and that it had come from outside the curriculum." . It is an attitude echoed in many schools. When Stolen Generations member Leone Pope talks at universities and TAFEs students say "Why hasn't anybody told us about this? We need to know more about it," and they feel betrayed that they don't know the proper history of their country . Students said that having had this knowledge available "would have helped to combat the racism and discrimination that exists in Australia today" . During a luncheon with children from Sydney's Northern Beaches, Aboriginal author Anita Heiss was shocked to learn that they hadn't heard the word "Koori" and didn't know what the Aboriginal flag looked like . In history curricula in 2011, the achievements and historical mistreatment of Aboriginal people weren't taught until Year 10 . As a consequence Aboriginal students who did not reach Year 10 could not learn about their own history. In the history curriculum draft for 2012 for Grade 4, Aboriginal people were grouped together with flora and fauna in the module that briefly covers the impacts of colonisation . The grouping was later changed.